From left: Kristine Augustine, Vice President, The Greater Scranton Chamber of Commerce; Amy L. Branning, Assistant Vice President, Commercial Lending Officer, Peoples Security Bank & Trust Company; Jill Zindle, Vice President, Merchant Services Manager, CPP, Peoples Security Bank & Trust Company; Sharon A. Byrne, Senior Vice President, Senior Commercial Loan Officer, Peoples Security Bank & Trust Company; and Mari Potis, Director of Membership and Events, The Greater Scranton Chamber of Commerce. 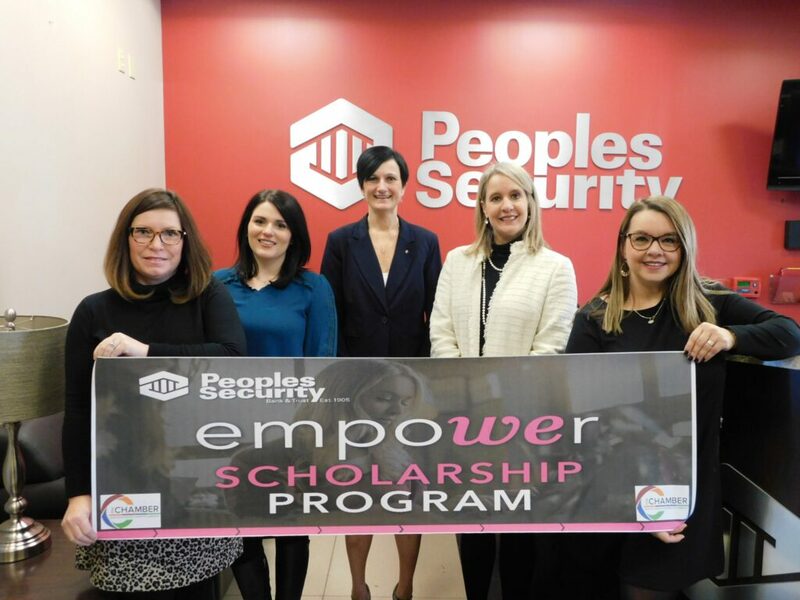 The Peoples Security Bank Empower Scholarship Program will provide opportunities for individuals and small businesses to attend and/or participate as a vendor at Empower NEPA Women’s Leadership Conference. Applications for this year’s scholarships will be accepted through Thursday, February 28, at 4 p.m.
Empower is the premier women’s leadership event in our region. Peoples Security Bank & Trust serves as the presenting sponsor. Empower is a day-long conference that highlights the ability all women have to create positive change in their communities and in their own lives, while recognizing the extraordinary power that exists when women come together to support each other. For more information, visit www.scrantonchamber.com/empower.